Managing all aspects of your account has never been easier! Click on the 'Home' icon beneath the pal list area. You can also click on your profile bubble on the top left to access the home screen. You will see various 'panels' that break the different aspects of Paltalk life into the appropriate pieces. 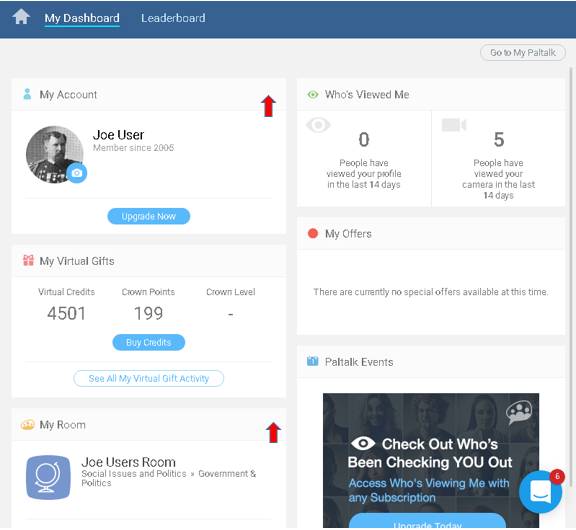 From here you can manage your account, set up, manage or open your chat room, upgrade subscriptions, buy and earn credits, and check all of your virtual gift activity. You would also see any special offers available to you. If you want to set up or edit your profile, click on the icon at the top right of the 'My Account' panel. If you want to view your profile click on the picture bubble at the top right of the 'My Account' panel. You can manage your profile photos by clicking on the camera icon that is embedded at the lower right of the picture bubble. From there you can upload new photos and pick a 'primary' profile photo. If you want to set it up or edit your chat room, click on the icon at the top right of the 'My Room' panel. If you want to open your 'My Paltalk' account management page for more options, click on the 'Go to My Paltalk' button near the top right of the 'Home' screen. Then click on the 'more settings' button to do things like update or verify your emails address, change your password or adjust privacy settings.